Hot flushes are no fun. Neither are night sweats, forgetting where your keys are, or indeed what your keys are for, and feeling glum, angry and tearful. All these delightful symptoms and more are signs of the peri-menopause that we will endure to a greater or lesser extent (maybe we already have or are in the midst of it all). Understandably, lots of ladies will look for natural and over the counter alternatives to help manage the symptoms because natural is better, right? I’m not here to tell you what you should and shouldn’t do but I want to give you the facts about traditional herbal medicines so you can make an informed choice. I don’t want to take HRT! Hormone Replacement Therapy or HRT has been much maligned over the years. As I’m a nutritionist and not a doctor, I can’t tell you whether HRT is right for you or not but I would urge you to consult a specialist GP, with experience in women’s health, particularly the menopause, and ask them to advise you on the risk factors and how they relate to your own circumstances. You may be surprised. Of course, no medication is without side effects but it’s important to weigh up the risks and benefits with all the facts at your fingertips, so ask an expert. Also, bear in mind the bigger picture, such as the risks associated with the menopause. Post-menopause, the risk of osteoporosis rises, alongside the uncomfortable and distressing peri- and post-menopause symptoms that affect your day to day quality of life, potentially for many years. Yes there are risks of taking HRT but an expert can put these risks in perspective and give you personalised advice where the Daily Mail cannot. And that is your choice. 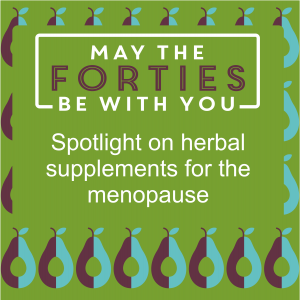 There are plenty of herbal supplements on the market claiming to help manage various symptoms of the menopause. An extract of the root of the black cohosh plant, for example, is a popular supplement that claims to relieve peri-menopausal symptoms like hot flushes, night sweats and changes in mood. You can find this herbal medicine in many natural supplements aimed at perimenopausal ladies. But what does the science say? A Cochrane Review (one of the most exacting ways of reviewing evidence) in 2012 concluded that there was insufficient evidence of any beneficial effects of black cohosh on relieving perimenopausal symptoms. That’s not to say that some studies do not show benefits but overall, the evidence is inconsistent, study quality is variable and results on the safety of this herbal medicine are inconclusive. This is true of most herbal medicines. Compared with pharmaceuticals, which go through rigorous safety and efficacy testing before they can be licensed (which is not to say that they are without side-effects), herbal medicines have a rather easier ride. That said, businesses should not market a herbal medicine without any intervention from the authorities in the UK. Brands should apply to the Medicines and Healthcare products Regulatory Agency (MHRA) for a Traditional Herbal Registration (THR) for their herbal medicine products. They are required to supply scientific data on the sourcing and quality of their product as well as a review of their safety data and evidence of the traditional use of the product that has been carried out by appropriate registered professionals. Only when the MHRA are happy will the THR Certification Mark be permitted for use on packaging. So, if you are buying traditional herbal medicines, make sure that you look out for this mark. They are granted on a brand by brand basis so if you see one on one brand of a specific herb or blend of herbs, it doesn’t mean that all brands selling the same product are similarly accredited. The table below gives you an idea of some of the herbal preparations that the MHRA has licensed and a summary of the claimed benefits, which are based upon traditional use only. I’ve omitted the manufacturers as this isn’t about selling you products (you can find the full list here though). Black Cohosh rhizome and root (Cimicifuga racemosa (L.) Nutt). For the relief of symptoms of the menopause, such as hot flushes, night sweats, and temporary changes in mood (such as nervous irritability and restlessness) based on traditional use only. For the relief of excessive sweating associated with the menopause based on traditional use only. St John’s Wort Herb (Hypericum perforatum L.) & Black Cohosh rhizome and root (Cimicifuga racemosa (L.) Nutt.). For the relief of symptoms of the menopause, including hot flushes, night sweats, slightly low mood and mild anxiety, based on traditional use only. For the symptomatic relief of menopausal symptoms, such as hot flushes, night sweats, poor sleep, mood changes and irritability, based on traditional use only. But it’s natural. It can’t do any harm, right? Well, many pharmaceuticals are naturally derived and the toxins from some plants, strychnine for example, can dispatch a human faster than you can say Agatha Christie, so natural is not always good, healthy or benign. FYI, it takes a little longer to die from strychnine poisoning but I didn’t want to ruin the narrative! The problem with herbal medicines is that they DO have a potentially potent effect on the body. While they may or may not help with the condition you’re trying to treat, they can interact with prescription medication and may cause health issues if you have existing conditions that affect how the liver or kidney functions, for example. St John’s Wort, which has been traditionally used to relieve hot flushes, night sweats and slightly low mood, can decrease the effectiveness of oral contraceptives and HRT. It can also interact with antidepressants to worsen the symptoms of depression, prolong the effects of sleeping tablets and reduce the effectiveness of a whole host of medications used to treat high blood pressure, heart disease, migraines, cancer, HIV and AIDS. These sort of interactions are not exclusive to St John’s Wort either so it’s essential to tell your doctor before you start taking any herbal medicines. Another concern is that adverse reactions to herbal medicines are not always reported in studies, so they may appear more benign than they actually are. Finally, if you buy supplements without the THR Certification mark, you have very little idea where they have come from. They could be contaminated with heavy metals or even prescription medication to enhance efficacy and you have little idea of whether the concentration and dose is appropriate. So should I just avoid herbal medicines altogether? To be honest, I personally wouldn’t use them but it is entirely up to you. My advice would be to speak to your doctor and potentially also a registered herbal practitioner who understands the relevant interactions with pharmaceuticals. Go for only those products with a THR Certifcation (full list is here), read the patient information leaflet carefully and do not exceed the stated dose.